Welcome back to my mini-series, Controversy in Fiction. Each post can be read separately and in no particular order, as each one explores a different topic. This week, I’ll be discussing diversity (particularly racial diversity) and its place in fiction. Originally, I wasn’t going to write about this topic because it intimidates me. Racial tension is such a drastic political issue in the United States right now that I find myself wanting to curl up with a book in a corner and pretend it doesn’t exist. Seriously, how can people hate each other so much? It breaks my heart. Then I found myself picking up more racially diverse books, from Outrun the Moon and Young Fu Of The Upper Yangtze to The Help and The Hate U Give. And I realized that since I’m writing a series on controversy in stories, I couldn’t be silent, even if I end up in a disagreement. Silence is a statement of sorts. So here goes. Brace yourself! Disclaimer: This post may contain controversial opinions that are not necessarily the same as those of readers. While my personal experiences come from a Caucasian perspective, I have done my best to remain objective and mean no offense. Similarly, I do not claim to know everything, but I have done my best to present each argument with dignity and respect. Having traveled throughout my life, I don’t know how a stereotypical white person is supposed to act. I don’t even know how your typical American is supposed to act. After all, I take my shoes off in my house like the Germans and the Japanese; I wear my hair down like the Hawaiians; I collect tea and look right before crossing the street like the English; and I am obsessed with recycling like the Europeans. Okay, so I’m being a little dramatic. But having been raised in a military culture and having lived overseas for a good portion of my life, I’m not familiar with the average American’s life. But I still thoroughly enjoy culture! I like figuring out where people come from; I strive for the overcoming culture shock; and I enjoy learning about cultural dos and don’ts. Throughout my life, my main influences have been my faith (Christianity), my family (the military community! ), and my books (mostly fiction). And books can be seriously influential. They can help you to see things from another person’s point of view. Words are a powerful thing! What do I mean when I say a book is diverse? Diverse books tend to represent racial minorities, particularly but not limited to those in the United States. To Kill a Mockingbird and Huckleberry Finn are two good examples of diverse—and often banned—books. But diverse books, particularly ones that are released today, are not limited to historical fiction. Diverse books come in many forms, from historical fiction to contemporary, and from science-fiction to fantasy. Likewise, these books feature various people groups, from the black community to the children of immigrants. Today, the publishing industry is bursting with diverse books. It’s one of THE things to be writing and reading. While the publishing rage for diversity in fiction may not last forever, the books themselves shall remain and continue to be published. Racially diverse books can give readers from that race characters to look up to and relate with. Likewise, books in and of themselves can be so enlightening. Not only can they be a means of travel, taking you to places you’ve never been, but they can also be a means of communication, bringing you voices you’ve never heard before. Or maybe you have heard such voices before, but you want to understand them better. Books can help you do that. The Hate U Give, set in contemporary America, reminded me that our justice system is biased. Inside Out & Back Again, historical fiction, taught me about immigration from Vietnam to the States and what it can be like for a child. Young Fu and the Upper Yangtze, historical fiction, taught me what life was like in the city in China during the 1920s. I could go on. Reading racially diverse books is important because it can help readers break out of their comfort zone of things they understand. Aside from learning from the culture itself, what better way is there to research another culture than to read about it? Diversity can be important, yes, but it’s not always accurate. Not every town you visit will have a diverse community. Some cities are more diverse than others. While small towns tend to have fewer differences, larger cities tend to have more diverse people groups. 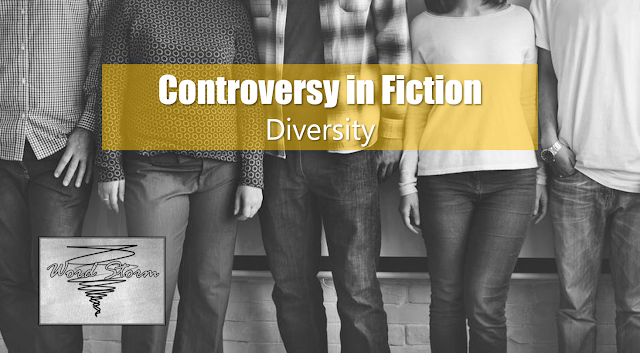 So when it comes to fiction, not every story can represent racial diversity. One summer, my friend Faith and I went to see Les Miserables in London. Although not a story known for its diversity, the role of Fantine was played by a woman who appeared to have Asian ancestry. Did you know, in the book, Fantine is blonde —like her daughter Cossette? But I fully support the casting decision. In theater and films, the best roles should go to the best actors—or in musicals, to the best singers. *Exceptions should be made for characters who, canonically, represent minorities. But I digress. I’m writing about books. Racial diversity can be a tricky thing to handle. Not only are racially diverse books offensive to racists, but these books might also offend those who are the subject of such racism. Huckleberry Finn and To Kill a Mockingbird have been banned at one time or another for their use of the n-word, despite the way their authors actually portrayed racism as an issue rather than an ideal. Racially speaking, I’m not among any minorities, unless you count that tiny percentage of Native American going who-knows-how-many generations back. (My siblings got the good gene on that one: they tan; I burn.) So I can’t speak from the perspective of an American minority unless you throw me into a city or state where Caucasians are sparse. I may not be a member of a minority, but I know what it’s like to feel like the odd-one-out. I may not be an immigrant, but I know what it’s like to live in a foreign culture. It’s so easy to relate with characters in books. And even if I can’t relate to a character, at least I can empathize with them. So when it comes to fiction, don’t just tell me I don’t understand a certain perspective. Help me understand. I’m listening. If all the books were told from the same perspective, the world would be a pretty boring place. But it’s not! I’m all for diverse books. The more the merrier. When I pick up a book written from another person’s perspective (basically any book, really), it’s a risk, yes. But it’s a risk worth taking. Let’s chat! What’s your take on diverse books? What are three diverse books you’d recommend? Do you have a particular perspective you like to read about, or do you enjoy them all? *Reindeer not included in giveaway.